Singur (West Bengal): Saraswati Sangha, a Singur-based social worker in her early 40s, is a bit apprehensive ahead of the Lok Sabha election. Sangha, who lives in the Beraberi panchayat, a Trinamool Congress (TMC) stronghold, had always voted for the Communist Party of India (Marxist), but will now cast her vote for the Bharatiya Janata Party (BJP), a relatively new entrant in West Bengal’s political landscape. She does not agree with the BJP’s religion-based politics — the trigger for her apprehensions — but says it is the only party that can challenge Mamata Banerjee’s TMC. “The reality is that the CPI(M) neither has leaders nor the capacity to take on the TMC,” she told ThePrint. Sangha’s sentiment finds resonance among several long-time Left Front supporters across West Bengal. From Cooch Behar to Siliguri, Malda to Asansol, and Singur and Nandigram to Kolkata, locals looking to challenge the TMC see the BJP as their only option, putting a big question mark on the Left Front’s prospects this Lok Sabha election. The Left Front includes the Communist Party of India (Marxist), the All India Forward Bloc (AIFB), and the Revolutionary Socialist Party (RSP). Dethroned by the TMC in 2011 after a 34-year rule in West Bengal, the Left seems to have since ceded the opposition space as well. Political analysts say the strengthening of the BJP’s influence in West Bengal is directly linked to the Left’s decline. “There is a fight for the opposition space. The Left vacating that space has helped the BJP make inroads and strengthen itself in the state,” said professor Samantak Das of Jadavpur University. Political activist Prasenjit Bose agrees. “In West Bengal, the Left vote is steadily shifting to the BJP,” he said. Speaking to ThePrint, Left leaders, party workers, political analysts and locals from different towns and villages across the state attributed the front’s decline to a host of reasons. In the 2011 assembly election, the CPI (M)-led Left Front fell to 62 seats in the 294-seat West Bengal House as Mamata stormed to office with 184. The 2014 Lok Sabha election saw a further dip, with the CPI(M) getting just two of the state’s 42 seats — down from 15 in 2009. Another shock awaited in the 2016 assembly election, when the Left Front parties got just 27 seats — 23 for the CPI(M), three for the RSP, and one for the AIFB. “There is a leadership vacuum in the party after many leaders shifted to the BJP or the TMC,” said former CPI(M) MLA Mafuja Khatun who joined the BJP in 2017. “Besides local leaders, hordes of grassroots workers across different levels have left, leaving the party in total disarray. I joined the BJP because there is nobody to give any direction, no strategy on how the party plans to take on the TMC,” she added. Khatun is the BJP’s candidate from Jangipur against Congress incumbent Abhijit Mukherjee, the son of former President Pranab Mukherjee. There are many former Left Front leaders who are contesting this Lok Sabha election as candidates of either the BJP or the TMC. BJP candidate from Malda North, Khagen Murmu, is a former CPI(M) MLA. Former Forward Bloc MP from Cooch Behar, Paresh Adhikary, will try to wrest the seat for the TMC this time, while incumbent TMC MP from Alipurduar, Dasrath Tirkey, is a former RSP member. According to political activist Bose, the Left’s decline can partly be blamed on the fact that its “leadership in Bengal has little credibility”. “The party has failed to groom the new generation of leaders, leaving many of them disillusioned. Many have also defected,” he added. Bose was expelled from the CPI(M) in 2012 when he criticised the party leadership for supporting Pranab Mukherjee’s candidature for President. Subhanil Chowdhury, assistant professor at Kolkata’s Institute of Development Studies, says the decline is mainly organisational and partly because the Left had failed to create any mass movement. “If you look at the 2014 Lok Sabha and 2016 assembly election data, you will see that while the TMC’s vote share has increased from 40 per cent to 45 per cent, the Left Front’s vote share has dipped from 30 per cent to 25.6 per cent,” Chowdhury told ThePrint. 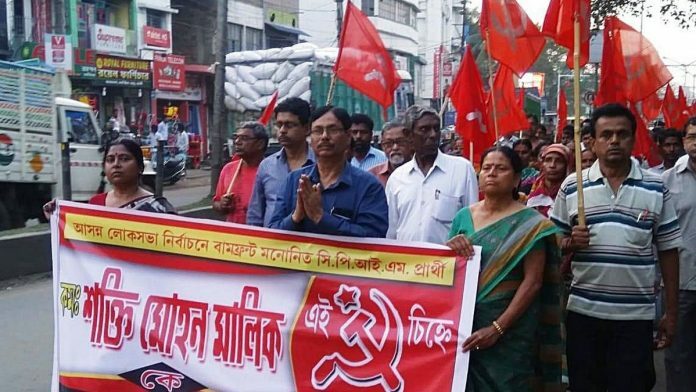 CPI(M) leaders agree that the Left has weakened in West Bengal. “The organisation has become weak but the structure is intact. We need to build back the confidence of the people. It will take time,” said CPI(M) politburo member Hannan Mollah. Talking about the shift of their voterbase to the BJP, Mollah said since the Left parties had become weak, it was natural for supporters to think they needed to go with a strong party. “There was a 34-year anti-incumbency. In a parliamentary democracy, no party can be in power forever. It’s a natural downfall,” he added. Meanwhile, even as they get set to vote for the BJP, hope prevails among Left supporters that the front will make a comeback.